For the 1972 film, see Garam Masala (1972 film). For the 2005 film, see Garam Masala (2005 film). For the 2013 film, see Garam Masala (2013 film). 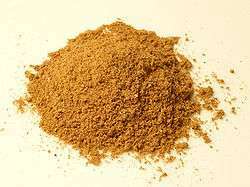 Garam masala (Hindi: गरम मसाला, Punjabi: ਗਰਮ ਮਸਾਲਾ,Urdu: گرم مصالحہ‎ garam ("hot") and masala (a mixture of spices)) is a blend of ground spices common in North India , Pakistan, and other South Asian cuisines. It is used alone or with other seasonings. The word garam refers to "heat" in the Ayurvedic sense of the word, meaning "to heat the body" as these spices, in the Ayurvedic system of medicine, elevate body temperature. Typical Ingredients for a garam masala (clockwise from upper left): Black peppercorns, mace, cinnamon, cloves, brown cardamom, nutmeg, and green cardamom. However, others can be used. Rogan josh: In the case of this Kashmiri speciality, for example, coriander, ginger and chilies are each ground individually, and a garam masala of cloves, cardamom, fennel, red or black chilies, cumin, turmeric and nutmeg, is prepared separately. The cook tastes the dish carefully to determine the precise moment when the next spice should be added. The order is coriander first, then the ground ginger, then the garam masala, and finally the chilies. Murgh kari (chicken curry): In this chicken dish, the procedure is also precise. First, the chicken is fried and removed from the pan. Onion, garlic, and fresh ginger are added to the pan and cooked slowly for 7 to 8 minutes. The next procedure is where the cumin, turmeric, ground coriander, cayenne, and fennel seeds are added with water and fried for a minute or so. The third procedure involves the addition of tomato concassé with fresh coriander, yoghurt, and salt. The chicken is returned to the pan and more water is added. Finally, some garam masala is sprinkled on top, the pot is tightly covered, and the dish cooks another 20 minutes before serving. Pulao (Pilaf): In Pakistan, garam masala is a common additive to various types of this dish. It is usually added to hot oil, where the onions have been fried golden brown. 1 2 3 4 Rama Rau, Santha (June 1969). The Cooking of India (Foods of the World). USA: Time Life Education. ISBN 978-0-8094-0069-0.